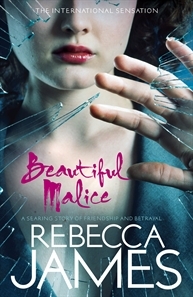 Even before it was published, the psychological thriller Beautiful Malice by Rebecca James, was an international sensation. The 39 year old Australian author and mother of 4, made international headlines in 2009 when her literary agent, Conville & Walsh in the UK, presented the manuscript to publishers at the Frankfurt Book Fair in October. The unpublished manuscript ignited an international bidding war between the various publishing houses that would eventually net the author more than $1 million in advances. This week the book’s Australian publisher, Allen & Unwin, became the first publishing house in the world to release the young adult novel. Beautiful Malice is also scheduled for publication in 35 other countries including the United Kingdom, United States, Germany, Brazil, Italy and the Netherlands. Not surprisingly, comparisons have been made between Rebecca James and the phenomenal success achieved by J.K. Rowling (Harry Potter) and Stephanie Meyer (Twilight). A rather unfair comparison perhaps when you consider Beautiful Malice will have to stand alone, without the benefit of an ongoing saga pushing sales into the stratosphere. No, the only question we should be asking is this: Does the published manuscript live up to all the hype? And in a word – yes – it does. Beautiful Malice is worth every cent the publishing industry is willing to pay for it. It’s that good. Beautiful Malice is told from the point of view of Katherine, a young woman who has experienced an unimaginable horror in her past, a fact which is utilised to full effect by the author as the story unfolds. In an attempt to escape the memory of her sister’s brutal murder, Katherine moves from Melbourne to Sydney, where she befriends the beautiful and charismatic Alice. Haunted by guilt over the death of her sister Rachel, Katherine is easily seduced by Alice’s apparent carefree approach to life. But there is a dark side to Alice. Beneath the party-girl facade, is a bitter and damaged young woman who threatens to destroy the lives of everyone around her. And as Katherine learns the truth about Alice, we will learn what really happened the night Katherine’s sister was murdered. Speaking of which, you too may find yourself screaming in anticipation of learning the truth, when at several points in the story, Katherine reveals all to the other characters, while still managing to keep us completely in the dark. Although this plot device requires that the author reveal just enough to raise the tension (and the blood pressure) a little more each time. I for one couldn’t stand the tension and in the end, I skipped an entire chapter just to learn the truth about what really happened on the night Rachel died. In fact this was so well executed by the author, that for some, the story of Rachel’s murder will ultimately over-shadow everything else, including the eventual self-destruction of Alice. NOOOOOOOOOO AUNTY DEBBY IT WAS HORRIBLE! UNREALISTIC AND BADLY WRITTEN. You know I love you darling, but I have to disagree with you on this one. the book is addictive! and habit-forming. what can I say? It’s awesome!